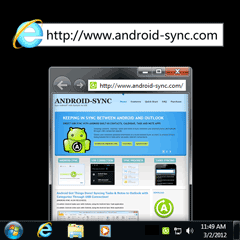 Android-Sync is the Android Sync Manager on Windows PC, works like the ActiveSync and the BlackBerry Desktop. 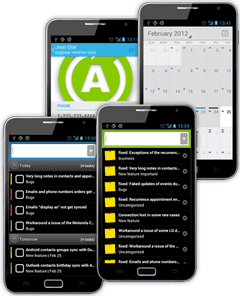 It syncs Outlook contacts, calendars, tasks and notes with Android devices over USB cable. It stores and syncs your sensitive personal information locally over USB with your own PC. And no data will be transferred to any online environment like Google’s. No cloud servers hosting your data. No over-the-air data transmission involved. Your data - direct to your device via the USB cable. Download and install [Android-Sync] from your Windows PC. 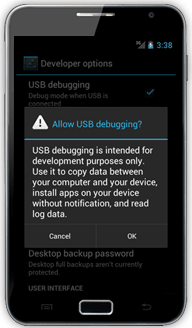 Turn on [USB debugging] from Android settings. Connect the Android phone or tablet to the PC. After the Android phone or tablet is connected to the PC, all the contacts, calendars, tasks, notes will be synced between Outlook and Android. Go and visit www.android-sync.com from your Windows PC now!